A spectacular South African grass, forming tussocks of pale green foliage from which long, pale-coloured plumes arch elegantly upwards and catch the low Autumn light. 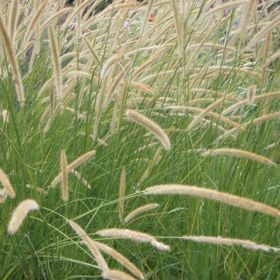 The Latin name Pennisetum has been allocated in response to such plumes, derived from penna, meaning ‘feather‘, and seta, meaning ‘bristle’ – the hairs attached to the flower plumes are feathered in some species. Though an exceptional ornamental for a sunny UK garden, in New Zealand, for instance, it is considered a serious weed. Via its vigorous rhizome system it can form dense infestations, which completely eliminate all other plants.